So I’ve been cutting back a little on sound effects. Case in point, the previous sequence is devoid of all the “spak” “spak” “spak” sounds of laser hits that I used a lot in the first story arc. 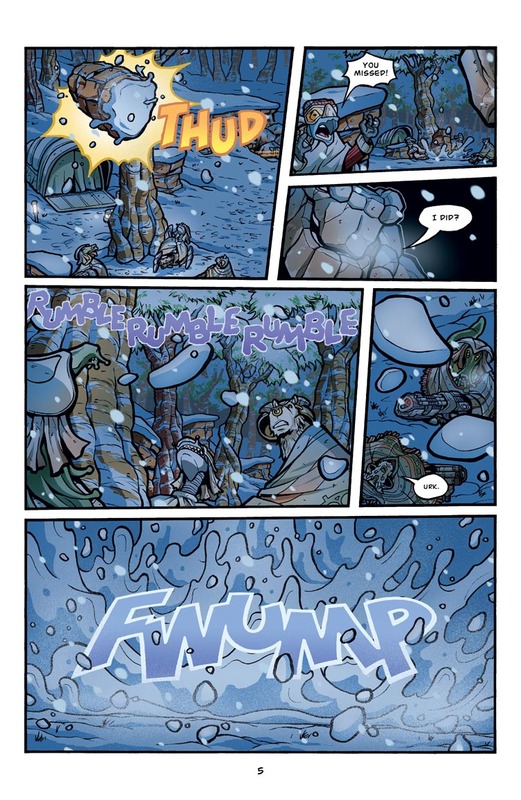 But on this page, I felt the sounds effects were pretty essential. It could have worked without them, but I think in this case, they add quite a bit. The last panel is my Bone moment. While it wasn’t intentional or a deliberate homage, every time I look at it, it just reminds me of the last beat of Bone #1, when winter descends on the valley in one giant sheet of snow. And for anyone who hasn’t read Jeff Smith’s Bone series yet, do yourself a favor and pick up! It has been a huge inspiration for me with Runners in more ways than I can count. But then I can’t really count that high. Seriously though, pick up Bone. It looks amazing in B&W (for which I’d recommend the one-volume edition if you have the upper body strength to handle it), and it looks even better in the recent color editions put out by Scholastic/Grafix. Ha, I thought of Bone when I saw this page, too! I like the POV in the next-to-last panel. I like the absence of laser sound effects (distracts from your artwork), I’ve cut metal all day with lasers, just a background buzz. But that last scene demanded a fwump! Did you establish a laughing face for Benne on this page? In any case I like it. It’s also nice to see that Benne has a gentle and humorous side. I mentioned in a previous post that Bennes is a bit tough for facial expressions, since the way I designed him, his mouth always seems to have a semi-smiley look to it. I guess he’s like a dolphin that way. That and his extreme agility in water. In this case, I think showing both rows of teeth is what really gets the actual smile across. The rest of his face isn’t really all that different from any other Bennes face, but the upper teeth kinda clinch it. And I like the second-to-last panel too. I don’t use a lot of black areas in my art in the inking stage, so I had to make a mental note on this panel to remember to do the really dark shadow over the characters in the coloring stage. Otherwise, the whole point of the panel would be lost. The sound effect are nice, not to square like some other comics. What? You think they wouldnt take heavy weaponry that could at one time come in handy and instead just use a single weapon for the entirety of their career? I don’t know. It’s weird but I actually see a kind of ethics code violation to stealing weapons and personal gear. For Roka’s crew, they’re specifically hired to steal back the yak for their rightful owner, so in their eyes, that’s cool. The yak don’t belong to the rustlers anyway, so it’s not really stealing from them. Something about stealing their weapons or other gear though seems a bit wrong. Regular pirates wouldn’t have a problem with that sort of thing, but I feel Roka would. I’m not entirely sure why, but it seems like Roka would find that petty or unethical, odd as that may sound. That said, they do already have an assortment of weapons on the Brimia aside from their personal firearms. For instance, the cannon that Bennesaud uses on Hamron’s ship in the Oniaka City Station in the first story arc. Ah, i was thinking through a D20 future aspect. I will definitely look into ComicHovel.com. In the meantime, if anyone knows of other webcomic sites that could help me get the word out on RUNNERS, please feel free to let me know! I do know the site but sadly haven’t done anything with the info yet. Ugh. I need more hours in a day. I’ll probably look into it at some point as I know it’s one of the top webcomic sites.